headed south from town. The right hand track to Marye's heights is a mystery. I revised the plan for expanding the model railroad to Fredericksburg a bit to better reflect the actual buildings and tracks in the city based on some more research. The information on what the town looked like, especially the area near the tracks, during the war is relatively sparse. One problem we have in trying to understand what the railroad looked like in 1863 is that the RF&P extensively rebuilt the right of way though Fredericksburg and north in 1910. They elevated the line through town on a viaduct and built a new station. They also relocated the line that was north of the river to remove curvature and built new bridges. The bottom line is that most vestiges of the civil war era railroad were destroyed. It is hard to look at the current right of way for prototype inspiration. So we must rely on the few photos we have, most taken from the north side of the river, and some maps that show the railroad right of way, most notably a hachure style topographic map from before the war, a Sanborn map from 1886, and the panoramic drawing shown above from 1863. The hachure topo map from the LoC shows two sidings in the town. One on the north side of the main line that goes to the freight depot (we know it was the freight depot from the Sanborn map, though some think this was also the engine shed that Haupt refers to in his memoirs). This map also shows a siding to the passenger depot on the south side of the mainline. The topo map shows a single track mainline, though a passing siding was probably likely, especially since the Sanborn map shows one too. The Sanborn map gives a lot more detail, but it is from 1886. You must be careful as some things changed in the intervening 23 years from when I am modeling to the time of the Sanborn map. 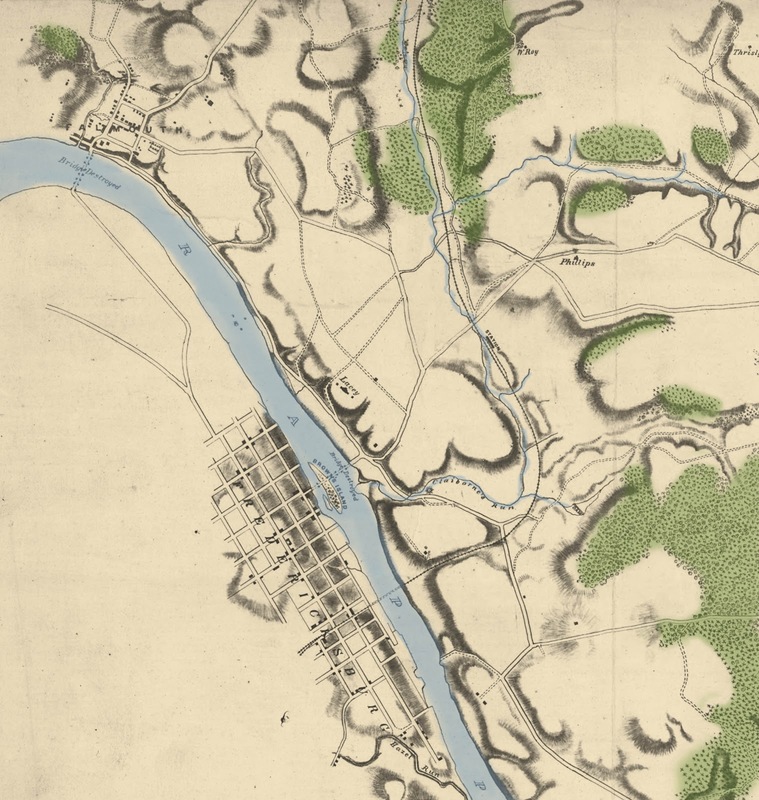 You can also learn more about the area by comparing later Sanborn maps to this one. The good news is that many of the structures shown in the 1886 Sanborn map do match well with the ACW era photos. By 1886 there was also a narrow gauge railroad that terminated near the RF&P depot. Some of its tracks show up on the Sanborn map, but those tracks were not there in the ACW. 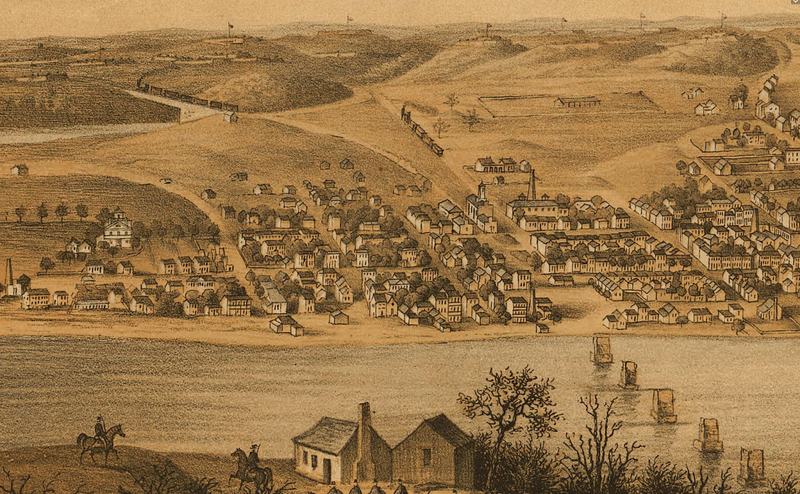 However, the panorama of Fredericksburg published in 1863 shows two tracks departing town to the south, one on the mainline and one to Marye's Heights. 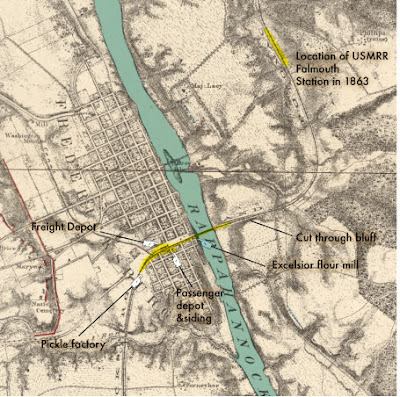 That track to Marye's Heights is a mystery to me as it doesn't show up on any other ACW era map or photo, except perhaps for the Mallory map that does show a junction south of the station. There was an unfinished railroad in this area that eventually became the Potomac, Fredericksburg and Piedmont Railroad. Could the rebels have built a line to Marye's Heights to supply their men there? The revised track plan reflects the new information from these maps as well as some other study of photos that I have done. The track plan is a double ended siding, with stub ended spurs on each side. The spur to the turntable is optional. Now that my locomotives have functional links on the pilots, I now longer need to reverse the engines at the south end of the line. However, I like how the turntable embellishes operations by giving the crew something else to do, so I think I will keep it. I included the bakery and the pickle factory in the design as they are interesting buildings. More on them later. The following is a letter written by a soldier from the 2nd Wisconsin. It has some interesting detail about the railroad facilities in Fredericksburg in 1862. From the Second Wis. Regiment Camp Ginnie's Station, Va. Your correspondent has remained silent thus long from the fact that his department failed to furnish anything worthy of note. Since I last wrote you our time has mainly been occupied in giving "a fancy drills" and "parades" for the especial benefit of our new Brigadier General. But within the last few days the white glove style has ceased and we now find ourselves the peaceful occupants of a former secesh camp nine miles south of Fredericksburg and within four miles of Ginnie's Station on the Fredericksburg & Richmond Railroad. How long we will remain here I know not but it is presumed that our forward movement will again commence by tomorrow. To rebuild the railroad bridges a detail of six hundred men was made from this Corps, fifty-one of which are from this Brigade. The three bridges between Acquia Creek and Fredericksburg were built inside of three weeks-the one crossing the Rappahannock being three hundred feet in length and the other one about ninety feet each in length- the whole work is under the supervision of Mr. Stone, U. S. Bridge Builder, Philadelphia. An extensive foundry and machine shop owned by a Mr. Jones, a rank secessionist, was seized and from the Bridge force a detail of fifty men were put at work building cars, repairing locomotives, &c., a steam portable saw mill has been turned out of this building within the last week and is now at this station. A Battery of cannon has been cast here and will soon be ready for service. A blacksmith shop is attached to it where twenty-two hands are employed shoeing army horses. You will understand this force employed at labor in this establishment are all Western men - Wisconsin and Indiana. They have material a-plenty to work with and are capable of turning out anything man may desire - either of wood, iron, brass or copper. As a matter of complement let me tell you that Mineral Point is represented in this establishment in the person of Nicholas Geig. Budlong is acting Commissary and general Orderly for the Commander of the force. He attends to the seizing of Secesh lumber whenever their representatives of the Davis click refuse remuneration for their property.The rebels when occupying Fredericksburg appear to have delighted in acting the part of barbarians. For instance the monument to Mrs. Washington, the mother of Gen. Washington, bears the marks of seventy-five bullets besides its being chipped off at the four corners. The monument is on a high eminence and from the mound you have a fine view of the city and surroundings. The citizens assert that this piece of architecture was used as a target during last winter. I understand an effort will be made through the soldiers to repair the monument. Hundreds would willingly contribute to so humane an object. From the monument of Mrs. Washington you have a full view of the two rebel burying grounds. In one there are three hundred graves and in the others a hundred and eighty. No regard appears to have been paid to color. The citizens say that the white soldier often became the occupant with the slave of the same vault. These are mostly North Carolina and Georgia troops and nearly all died with three months. On Sunday the rebel magazine at Fredericksburg exploded killing a private who was guarding it throwing his right leg over thirty feet from the spot . The brother of this young solider was an eye witness and but a little way from him but strange to say was unharmed. In the magazine there were seventy boxes of cartridges and two torpedoes which but a few days since were taken from under the platform at the depot and placed in the magazine for safe keeping. The cause of the explosion is unknown. A number of arrests have been made but whether any of the unruly secesh are implicated in the transaction is as yet unknown. Soon after the explosion and while the affair was being investigated a secessionist standing by remarked to one of our soldiers, "that the private killed was served right and had received his reward for being among the invaders" this man had no sooner finished his sentence than he measured his length on the mother earth. He was roundly thrashed in the presence of his fellow citizens and raised on his feet and told to "hunt his hole," and not dare to ever again offer an insult to the Union soldiers. It will teach him as well as hundreds of others of sympathizing rebels that their lips must be sealed when in the presence of the Union boys that our soldiers know how to resent an insult notwithstanding their feelings. This part of Virginia is thoroughly secesh and they have been bold in their remarks. The women in particular have a general abhorrence of the Union soldiers. To show their contempt rather than walk under the Stars and Stripes which are hung out in front of the City Hall, they will walk in the middle of the street, draw their veils closely over their pretty shaped faces, turn up their noses and trot along as gay as you please. If you look at one she become desperately fidgety and almost frantic with rage and if you speak to her oh! my the silly thing flirt's around almost beside herself and gives you to distinctly understand that her cap is set for a "bold southerner. "- Perhaps they don't understand that we Northerners are inclined to furnish them with subsistence - that but for the ready hand of Abraham they would starve in less than a week. As for good looks you cannot flatter them - in fact they have become so used to turning up their noses in contempt for things to their disliking that it spoils their good looks if they ever possessed so necessary an article. Great letter...."hunt his hole,"..yet....we Northerners are inclined to furnish them with subsistence - that but for the ready hand of Abraham they would starve in less than a week. As for good looks you cannot flatter them - in fact they have become so used to turning up their noses in contempt for things to their disliking that it spoils their good looks if they ever possessed so necessary an article. 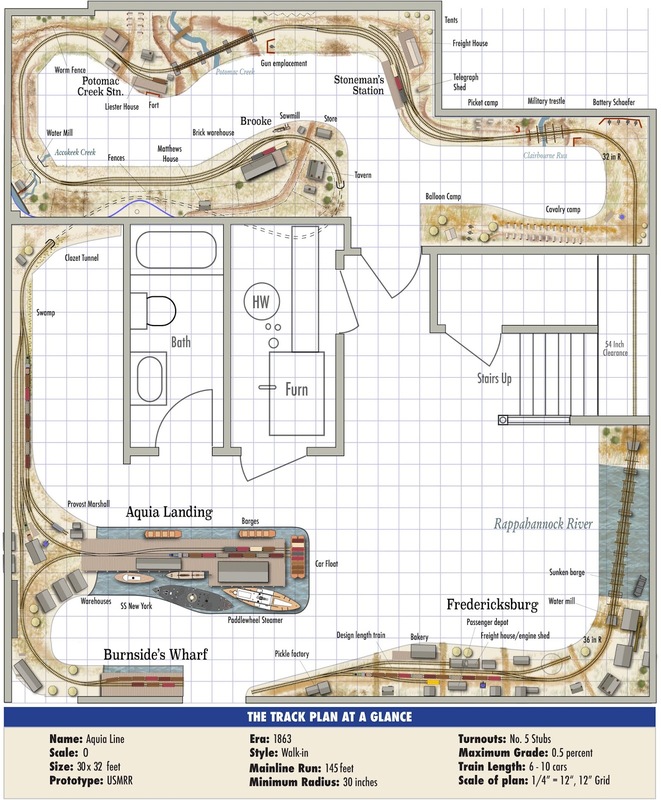 Hi Bernard, I really like this revision to the track plan. No duck unders, plenty of space - crew swinging, standing, talking room. A long bridge, which always looks good. Less is more I reckon!